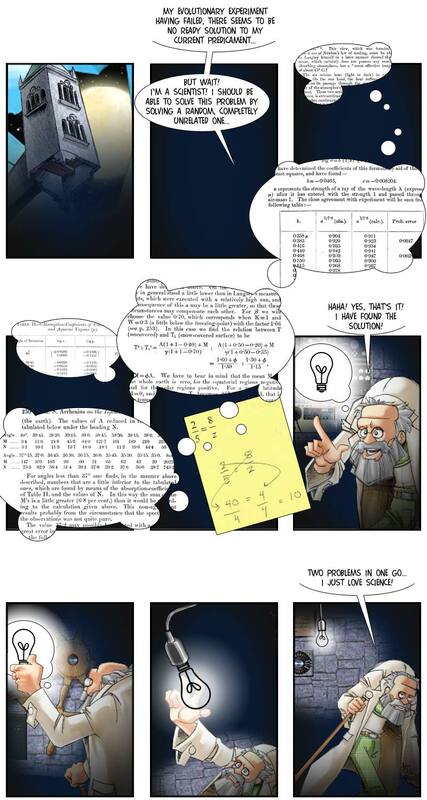 The Professor has passed on a couple of opportunities to get some light easily – but now he’s finally woken up to the fact that he possesses what practically amounts to a built-in lightsource: as a scientist in a comic strip, he just needs to come up with the solution to some problem (regardless of that problem’s nature and connection to the situation at hand) and a lightbulb will appear in a bubble next to his head. It’s usually just a very abstract or even schematic lightbulb, but it does provide steady light without requiring any external source of power. Few people realize it, but that actually was what lightbulbs were invented for! In those prudish, Victorian times polite society was no longer willing to suffer scientists signifying their discoveries and invention in the time-honored, Archimedean fashion: by running around wet and naked and shouting like mad. The lightbulb was a result of research into a more dignified way for scientists to announce their intellectual achievements – only after the lightbulb had been invented (and its invention announced by a wet, naked guy shouting like mad – of course he couldn’t yet use his new invention to signify his new invention) did people realize that it could serve a much more general purpose than the one originally intended. Given the way society’s ever-evolving standards of decency seem headed and the high energy consumption of incandescent lightbulbs, it’s likely only a matter of time until scientists will start to return to the older, more eco-friendly tradition, however.